In the Gospel of John, the Evangelist often refers to the miracles that Jesus performs as signs because they point to something more significant. Some of the signs or important events happen near the time of Passover. The Passover was and is the Jewish celebration of their deliverance from their Egyptian captivity. After the angel of death passed over the homes of the Israelites that were marked with lamb’s blood, it struck down the first-born of Pharaoh and all the Egyptians. After this event, Pharaoh allowed the Israelites to leave Egypt. Jesus is not only the fulfillment of the Law and the Prophets, he is also the fulfillment of the Passover, because he is the Lamb of God who shed his blood to save us from eternal death. That’s why the Feast of the Passover is so significant in the ministry of Jesus. Today’s Gospel also mentions that the Jewish feast of Passover is near and the miracle, or sign that Jesus will perform, the multiplication of the loaves and fishes is also Eucharistic because it points to the bread that will be changed into the Body of Christ, which will feed the multitudes until the end of time. An interesting point in this Gospel is that Jesus asks Philip, “Where can we buy enough food for them to eat,” even though he already knew what he was going to do. There is a message here for us. When we are confronted with challenges and trials and we ask the Lord for help, he may ask us what contribution we will make to resolve the difficulty. Perhaps it is our prayer and fasting or it may be the use of the gifts that we have received from the Holy Spirit in baptism. We all have something that the Lord can use and he wants us to be involved in the resolution. Another interesting point: “Now there was a great deal of grass in that place.” This abundance of grass means it was spring time. Our pilgrim groups have stayed on the Mount of Beatitudes, where we could over look the beautiful Sea of Galilee and this very spot where Jesus performed this miracle. As you look down from the mount toward the Sea you will find an area that is almost shaped like an amphitheater which could easily accommodate thousands of people. This is where Jesus multiplied five loaves and two fish in order to feed thousands of his followers. This miracle of the multiplication is a prelude to Jesus discourse on the Eucharist, the Bread of Life, which he proclaims to the crowds that seek him out the next day. He admonishes them because they were interested primarily in the food he had provided. He then explains to them at great length that he is the Bread of Life which they must eat if they are to have eternal life. Four times he tells them they must eat his flesh and drink his blood if they are to live forever. Many of his followers found this teaching to difficult to accept and would no longer follow him. The final Passover that Jesus celebrates is what we call the Last Supper. This event ties together the miracle of the wine and the miracle of the loaves. 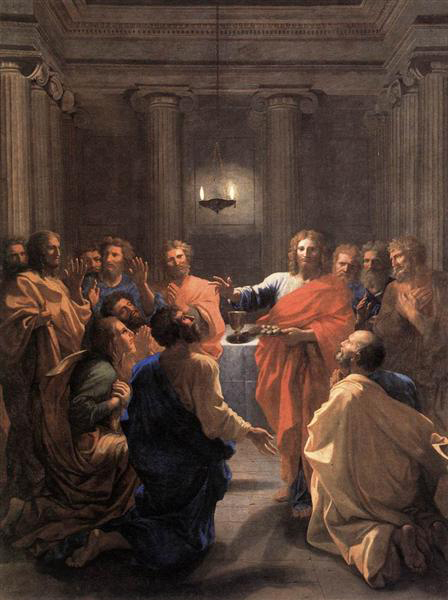 At the Last Supper Jesus not only teaches his apostles that they must be servants of one another by washing their feet; he also institutes the priesthood and the sacrament of the Holy Eucharist. The Apostles who faithfully stayed with Jesus because they believed in him will finally understand how Jesus will give them his blood to drink and his flesh to eat. They become his first priests and Jesus will change bread and wine into his own body and blood through their hands and the hands of all the priests who will follow them. The Holy Eucharist is a mystery of God’s love for us. At this Eucharist which we celebrate today and at every Eucharist celebrated everyday, every where in the world, Jesus Christ makes present to us his passion, death and resurrection. When we come to worship our Triune God we transcend time as we join the angels and saints offering praise and glory to Almighty God. We also have the opportunity to receive the body and blood of Jesus Christ if we are properly prepared and disposed. This is not an empty ritual as some may think. Jesus loves us so much that he gives us himself under the appearance of bread and wine, but not all who receive Holy Communion receive the same benefit. It depends on how we have prepared. Have we fasted for one hour from everything except water and medicine? The purpose of this small fast is to remind us that we are about to enter into a supernatural experience. How long has it been since we have gone to Confession? We cannot receive the Lord in Communion if we have mortal sin on our soul. Sin is an obstacle to the grace that Jesus wants us to receive. Are we dressed as if we were going to have a personal encounter with Jesus Christ? Sunday Mass should be the high point of our week because we come together as a faith community to bear witness to our love for God and one another and His love for us. Jesus wants us to receive a super abundance of his grace, but he also wants us to be prepared to enter into intimacy with him so that we can be transformed by his love for our own good and the good of his Church. What we bring to this celebration is not only for our selves, it is for the whole body of Christ. What Did the Early Christians See? One of my favorite places to visit in Rome are the Catacombs of St. Callixtus. So you are probably thinking – what? She is in Rome, the eternal city with Piazzas, art and cuisine and she is excited about a Christian burial place? Wait! They represent a lot more than just a burial site. These Catacombs are located on the Appian Way in Rome, with nearly 12 miles of underground burial places used by the early Christians in the second century. Named after a St. Callistux, a deacon who was appointed by Pope Zephyrinus to be the administrator of the cemetery, so it became the official cemetery of the Church of Rome. One of the underground areas is called “the little Vatican” because nine Popes were buried there along with several dignitaries of the early Church in Rome. The visit is fascinating! Each time I visit these Catacombs, I am reminded of the deep love and hope the early Christians had in the Christian Faith and Church. Our guide introduces the place, explaining what we will see – burial places and the symbols of the early Church in Frescoes from the 2nd and 3rd centuries. The early Christians, we were told, used these symbols in sharing their testimony of faith. They would see these images as signs of hope and encouragement. –The Good Shepherd with a lamb around his shoulders representing Christ and the soul which He has saved. The “orante” figure with open arms symbolizing the soul that lives in divine peace. The monogram of Christ, formed by interlacing two letters of the Greek alphabet: X (chi) and P (ro), which are the first two letters of the Greek word “Christòs” or Christ. When this monogram was placed on a tombstone, it meant a Christian was buried there. The Ichtùs Fish (in Greek one says IXTHYS. Placed vertically, the letters of this word form an acrostic: Iesùs Christòs Theòu Uiòs Sotèr – Greek for “Jesus Christ, Son of God, Savior.” Acrostic is a Greek-derived word that means the first letter of every line or paragraph. The fish is a widespread symbol of Christ, a motto and a compendium of the Christian faith. The dove holding an olive branch symbolizes the soul that reached divine peace. The Alpha and the Omega are the first and the last letters of the Greek alphabet. They signify that Christ is the beginning and the end of all things. These were their symbols reminding them of the Christian Faith. Walking down 25-30 steps into a dimly lit narrow tunnel, the ground uneven – just think, we are walking on the original ground! 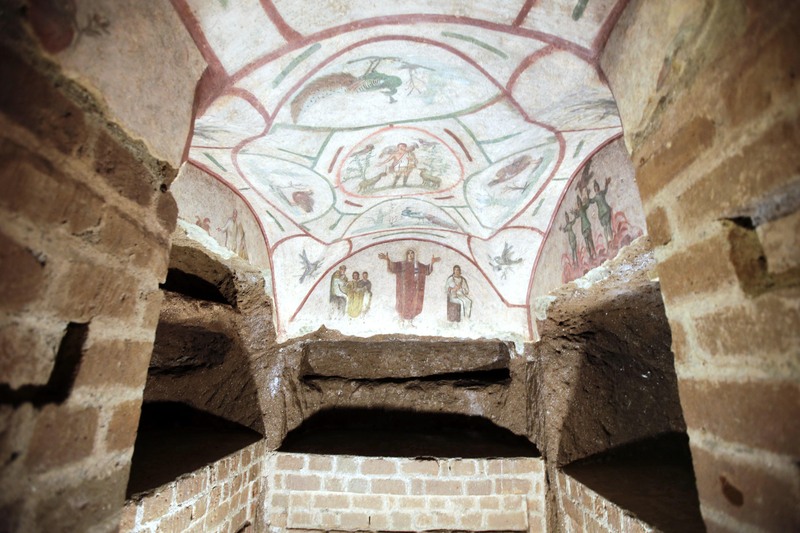 There are thousands of burial places (some small due to the large infant mortality at that time), ancient oil lamps, the frescoes, large open crypts and small cubicles with more frescoes. As our guide was finishing his explanation and leading us to stairs to exit, we asked to remain in one of the cubicles where one of the Popes was buried to pray. It was near the exit, so we wouldn’t get lost!. The early Christians didn’t have the Bible, nor a Catechism of the Catholic Church, nor a Rosary, nor a Crucifix! After all, the Crucifix was scandalous because Romans were still crucifying Christians and criminals during that time. What did they have? They had the “faith stories” of Christians, including those who were martyred and encouraged others to remain steadfast. They heard Bishops proclaim the Truths of the faith, encouraging them to have hope, and as a result, they became witnesses of their faith in Jesus Christ and his, Gospel even at the cost of personal sacrifice. They saw how many Christians died for their faith in Christ. For me, the faith and hope of the early Christians encourages me to remain secure in what I believe as a Catholic Christian. I am also reminded of the importance to share my faith story with others, so they, too can be encouraged. Faith has to be shared in order to be lived. When was the last time you shared your faith? Interested in an outline on sharing your faith story? Contact me at dtmjfox@pilgrimcenterofhope.org for the ABC’s of telling your faith story.